Christiaan Huygens (April 14, 1629 – July 8, 1695), was a Dutch mathematician, astronomer, and physicist best known for his astronomical discoveries, including the rings of the planet Saturn and Saturn's largest satellite, Titan. He was the inventor of the pendulum clock, and his work in mechanics became the basis for some of Isaac Newton's laws of motion. 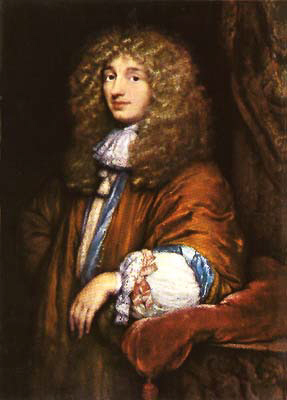 Born in The Hague, Christiaan Huygens was the second son of Constantijn Huygens, a well-placed official who was secretary to the princes of Orange. Huygens's father was also a friend of Rene Descartes and a prolific poet. At first, Constantijn tutored Huygens and his elder brother, but in 1845, at age 16, Huygens was sent to the University of Leiden to study law and mathematics. He spent a year there, afterwards attending the College of Orange in Breda, where his father was curator. During his school years, he enjoyed an active social life, and took up non-scholastic activities such as fencing. Among his mathematics instructors were John Pell and Frans Van Schooten. Apparently, Huygens sported a mustache at the time, and wore his sword to class. A fight broke out, and, under criticism from school officials, Huygens's father called him home. In 1849, he took a trip to Denmark with the hope of meeting Descartes, but the entourage with which he traveled left the country before a meeting could be arranged. In 1651, Huygens published his first important work on the quadrature of the circle—the task of finding the dimensions of a square with the same area as a given circle. He also addressed a similar problem with respect to the ellipse and the hyperbola. His results contradicted those of a well-recognized contemporary, in that Huygens announced that "Pi" was an irrational number. The very next year, Huygens discovered the laws of collision—the relationship between the velocities and masses of two bodies before and after they collide. His results were in conflict with those of Descartes, whom he greatly admired. Huygens refused to concede his conclusion, but he was dissuaded from publishing his findings until 1669. Isaac Newton later cited Huygens as elucidating the principles upon which Newton formulated his second law of motion. In 1655, Huygens traveled to France and was awarded his doctorate at Angiers. Around this time, Huygens and his brother, Constantijn, Jr., worked together to perfect telescopes, and were able to obtain clearer and more highly magnified images than their contemporaries. As a result, Huygens discovered Saturn's largest moon, Titan, and Saturn's planetary rings. In the same year, he observed and sketched the Orion Nebula. His drawing, the first such known of the Orion nebula, was published in Systema Saturnium in 1659. Using his modern telescope, he succeeded in subdividing the nebula into different stars. He also discovered several interstellar nebulae and some double stars. After Blaise Pascal encouraged him to do so, Huygens wrote the first book on probability theory, which he published in 1657. His invention on Christmas 1656, the pendulum clock (patented 1657), was a breakthrough in timekeeping. Devices known as escapements regulate the rate of a watch or clock, and the anchor escapement represented a major step in the development of accurate watches. Subsequent to this invention, Huygens discovered that the period of a pendulum moving along a circular path varied with its amplitude to a small degree, and he sought to establish the curve which, if a weight is constricted to follow while being acted on by gravity, will produce a motion in which the period is independent of the amplitude. He found that this curve was the cycloid. By constraining the bob to move along such a curve in the form of cycloidal cheeks guiding a flexible pendulum suspension, he ensured a regular (that is, isochronous) swing of the pendulum irrespective of its amplitude—irrespective of how far it moved side to side. The mathematical and practical details of this finding were published in Horologium Oscillatorium of 1673. Huygens also observed that two pendulums mounted on the same beam will come to swing in perfectly opposite directions, an observation he referred to as odd sympathy. Contrary to sometimes expressed popular belief, Huygens was not a clockmaker, and is not known to have ever made any clock himself; he was a scholar, scientist, and inventor, and the oldest known pendulum clocks were made "under the privilege"—that is, based on a license from Huygens—by Salomon Coster in The Hague. The oldest known Huygens style pendulum clock is dated 1657 and can be seen at the Museum Boerhaave in Leiden, which also displays an important astronomical clock owned and used by Huygens. Huygens also developed a balance spring clock more or less contemporaneously with, though separately from, Robert Hooke, and controversy over whose invention was the earlier persisted for centuries. In February 2006, a long-lost copy of Hooke's handwritten notes from several decades' Royal Society meetings was discovered in a cupboard in Hampshire, and the balance-spring controversy appears by evidence contained in those notes to be settled in favor of Hooke's claim. Around 1859, Huygens uncovered a principle that comes close to Newton's second law of motion. Huygens discovered that the force upon a moving body is proportional to the product of the square of the velocity and the distance traveled. In 1660, Huygens spent a year in France, and another year in England, where he instructed members of the Royal Society of London regarding the methods he used to construct telescopes. As a result, he was elected a member of the society in 1663. He traveled again to France the same year, and thereafter was sought by the court of King Louis XIV, who offered him a substantial salary and lodging, among other incentives. In the year 1666, Huygens moved to Paris, where he held a position at the French Academy of Sciences. Using the Paris Observatory (completed in 1672) he made further astronomical observations. Between 1661 and 1664, Huygens solved the problem of finding the center of oscillation of a rigid body. If a rod is suspended and allowed to swing, the period of its motions back and forth will be shorter than if the entire mass were concentrated at the bottom of the rod. Calculating the exact period of such a rigid rod was a daunting task for physicists of the time, but Huygens provided the solution, which had important applications for his pendulum clocks. An adjustable weight was added to the rod connecting the suspension point with the pendulum bob, so that the period of oscillation could be adjusted if necessary. During his stay at the court of Louis XIV, Huygens continued mathematical and astronomical research, and published a number of memoirs. He was beset by periodic illness, which caused him to return for a time to the Hague in 1670 and 1675. In 1869, he reported to the academy his finding that for a body moving at a uniform speed in a circle, the acceleration is directed toward the center of the circle and is proportional to the speed squared, divided by the radius of the circle. This was an important finding that assisted Newton in his discovery of the inverse square law of gravitation. All these things deserve to be carefully investigated, in order to ascertain how and by what process nature produces them. It seems to me that in general, the regularity which is found in these productions arises from the arrangement of the small equal and invisible particles of which they are composed. Huygens supported the view that light was transmitted by means of the action of waves in a medium, and not by particles emanating from the source of the illumination. By this model, he was able to ingeniously explain reflection, refraction, and even the complex phenomenon of double refraction observed in some crystals, such as Icelandic spar. He published his findings in Treatise on Light. Huygens's views contrasted with those of Isaac Newton, who generally promulgated a view that light was a stream of particles. Newton's support of a contrary hypothesis delayed the acceptance of Huygens's for over a century. In 1675, Christiaan Huygens patented a pocket watch. He also invented numerous other devices, including a 31 tone to the octave keyboard instrument, which made use of his discovery of 31 equal temperaments. Huygens moved back to The Hague in 1681, after suffering serious illness. He attempted to return to France in 1685, but the revocation of the Edict of Nantes precluded this move, as he was a Protestant, a religion that had become outlawed. In 1684, he published Astroscopia Compendiaria, which presented his new aerial (tubeless) telescope with a focal length of 123 feet. Huygens's Treatise on Light was finally printed in 1690. Huygens speculated in detail about life on other planets. In his book, Cosmotheoros, further entitled The Celestial Worlds Discover'd: Or, Conjectures Concerning the Inhabitants, Plants, and Productions of the Worlds in the Planets, he imagined a universe brimming with life, much of it very similar to life on seventeenth century Earth. The liberal climate in the Netherlands of that time not only allowed but encouraged such speculation. In sharp contrast, philosopher Giordano Bruno, who also believed in many inhabited worlds, was burned at the stake by the Italian authorities for his beliefs, in 1600. This work was published posthumously, with the help of his brother, Constantijn, Jr., to whom it was dedicated. Huygens died in the Hague on July 8, 1695. Huygens made important breakthroughs in mathematical physics that were expanded upon by Isaac Newton into Newton's coherent presentation in the Principia. These breakthroughs include Huygens's mathematical presentation of uniform circular motion, his solution to the oscillation of a rigid body, and his analysis of the collisions between two moving bodies. His astronomical studies were also important, as were his accomplishments in telescope construction and optics that made them possible. Huygens was recognized in his time as one of the leading mathematicians. His legacy, particularly in view of later discoveries on the nature of light, remains undiminished. These accomplishments are particularly noteworthy when one considers that Huygens enjoyed socializing and was challenged by poor health, conditions that contrast with the image of Isaac Newton, which is practically one of a recluse. It is apparent that Huygens's intellectual curiosity is what drove him to great achievement, although he left a track record of invention that also helped humanity in a substantial way. It appears that his departure from Paris, in 1881, was at least partly due to the loss of tolerance for Protestantism by the French monarchy. Although an exception would have undoubtedly been made for him, Huygens chose to leave Paris for the more open society of the Netherlands. This indicates that Huygens was a man of strong religious convictions. The brighter interior of the Orion Nebula bears the name of the Huygens Region in his honor. W.I.S.V. Christiaan Huygens: Dutch study guild for the studies Mathematics and Computer Science at the Delft University of Technology. Huygens Laboratory: Home of the Physics department at Leiden University, The Netherlands. Huygens Supercomputer: National Supercomputer facility of The Netherlands, located at SARA in Amsterdam. ↑ Hans van den Ende: "Huygens's Legacy, The Golden Age of the Pendulum Clock," Fromanteel Ldt., 2004. ↑ C. Huygens and David Brewster, On the cause of the extraordinary figure of calcareous spar, and on its cleavage in three directions, The Edinburgh Journal of Science (Edinburgh: Thomas Clark, 1828), 314-317. ↑ Humphrey Lloyd, Elementary Treatise on the Wave-Theory of Light (London: Longmans, Green, 1873), 45-46. ↑ www.phys.uu.nl, Cosmotheoros. Retrieved September 22, 2007. Andriesse, Cornelis Dirk and Sally Miedema. 2005. Huygens: The Man Behind the Principle. Cambridge: Cambridge University Press. Chalmers, A., ed. 1814. Huygens. In A General Biographical Dictionary. London: J. Nichols and Son. Olmsted, J.W. 1960. Voyage of Jean Richter to Arcadia in 1670. In Proceedings, American Philosophical Society. 104:5. John J. O'Connor and Edmund F. Robertson. Christiaan Huygens at the MacTutor archive. Works by Christiaan Huygens. Project Gutenberg. How to pronounce "Christiaan Huygens" (includes sound file of pronunciations by Dutch people). Systema Saturnium 1659 text a digital edition of Smithsonian Libraries. Christiaan Huygens on the 25 Dutch Guilder banknote of the 1950s.. This page was last modified on 16 February 2017, at 23:14.